For over a year, my daughter stuck to PBS and The Disney Channel when it came to her viewing habits. In the past year or so, she’s migrated away from public television (I’ll always love you Sesame Street, I’ll see you again when Jack’s older!) and now prefers On Demand and Cartoon Network. I’m cool with this for the most part, especially because CN has a variety of cool shows from wildly creative people like Steven Universe and Rebecca Sugar. I admit, when I first saw the spots for this show, I wasn’t sure what to expect. Part of that came from the fact that the story’s background isn’t directly expressed at the top of the series. If you watch the episodes or read the Wiki page you’ll discover that Steven’s mom Rose Quartz used to be part of a group of intergalactic protectors known as The Crystal Gems. With her gone, Steven stumbled upon her jewel, which placed itself in his belly button. Now he hangs out with his mom’s former teammates Amethyst, Pearl and Garnet in a palace that sits in Steven’s hometown of Beach City. 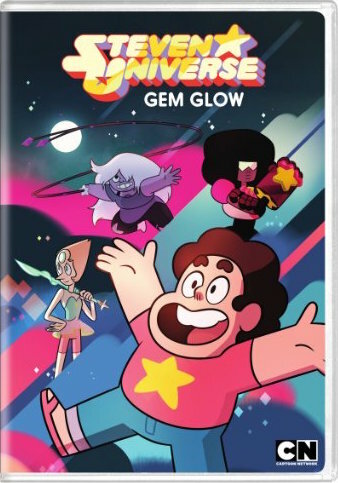 Given their jobs, Steven and the Crystal Gems go up against a variety of monsters, mystical objects and neighbors who disapprove of their superheroics. This batch acts as a wonder introduction to what this series is and what it offers, which is a positive, delightful series that, while often odd, features positive relationships, heroics and real life problems that kids can relate to, like continually getting Dave Guy when you really want a Ranger Guy. As an added bonus this disc includes the pilot which was a fun look at how the series started. From a kid’s perspective, my 3-year-old daughter quickly fell in love with this disc and wants to watch it pretty much constantly. Normally I’m not a big fan of compilations like this and prefer a full season in chronological order, but I appreciate this disc because I can put it on for a few hours and just let my kid become engrossed while she plays. Lastly, I’m pretty sure I’ve fallen in love with the Steven Universe theme song. Here’s hoping a soundtrack album isn’t far behind.